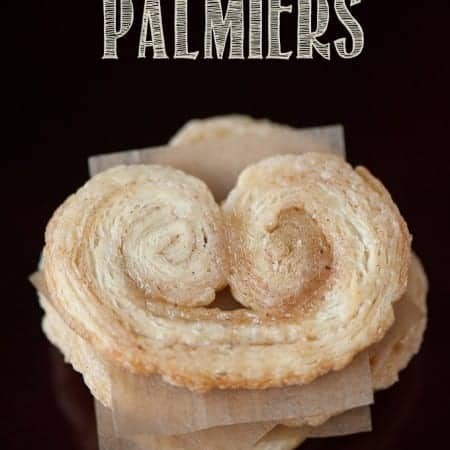 These three ingredient Easy Petite Palmiers look fancy but are quite possibly the easiest cookie you’ll ever make. I can’t believe it is December all ready. Time seems to go by faster the older I get, and no month goes by faster than the month of December. Between Christmas concerts at the school, the annual visit to Zoolights, the shopping, the wrapping, the eating (of course), and me wanting to get in my jammies by 4pm every day because its cold and dark here in Oregon, this month usually flies by in a heartbeat. That is one of the main reasons I love to make these cookies. 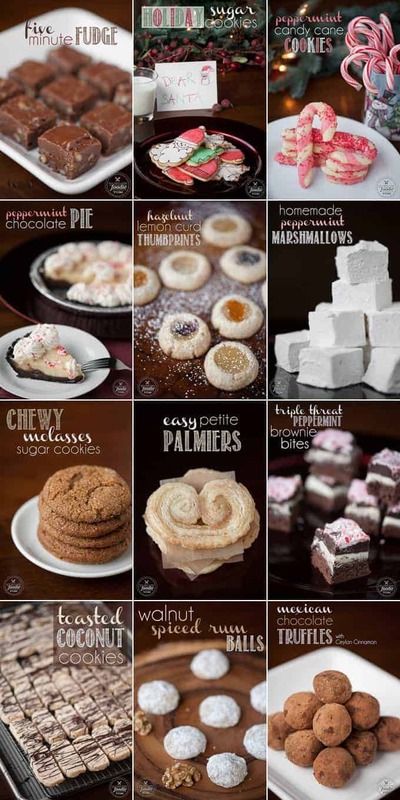 Some of the treats I make at Christmas time are quite the commitment,but recipes like this one and other easy ones like my five minute fudge or Granny’s monkey bread refresh my enthusiasm and keep me from completely giving up. You start by making a mixture of sugar and pumpkin pie spice. I used extra fine sugar because I had it out and was using it to make other cookies. But these cookies would benefit from using a larger grain sugar as well. Its up to personal preference. I must admit, though, that spreading that extra fine sugar around was like playing in super soft sand and it was fun. Use a super sharp knife to slice those chilled bad boys and don’t worry about that end piece being all ugly. Its justification for you getting to eat it as soon as its cool enough to handle. Just look at how pretty they turn out! They look so fancy and no one will know it was simply the easiest cookie to make. Aren’t they pretty? 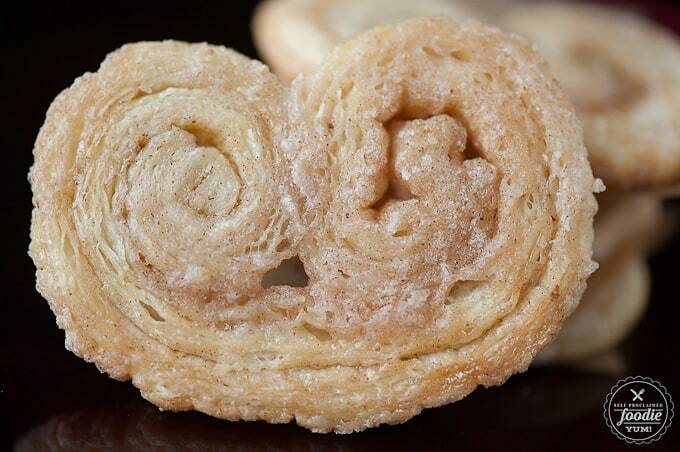 I love looking at all the buttery and sugary layers with the little bits of spicy goodness. 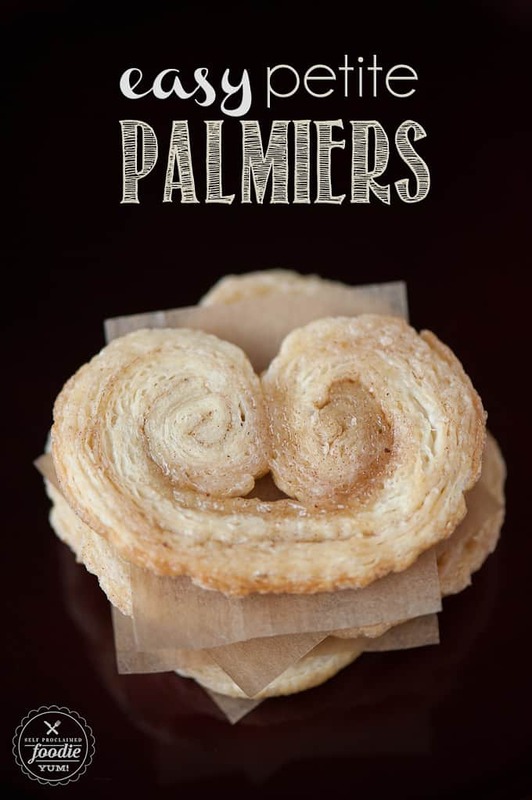 These three ingredient Easy Petite Palmiers look fancy but are quite possibly the easiest cookie you'll ever make. In small bowl, combine sugar, pumpkin pie spice, and salt. On a large flat piece of plastic wrap, pour about a third of the sugar mixture and create an even layer that's about 10x10 inches in size. Lay your first puff pastry sheet on top of the sugar. 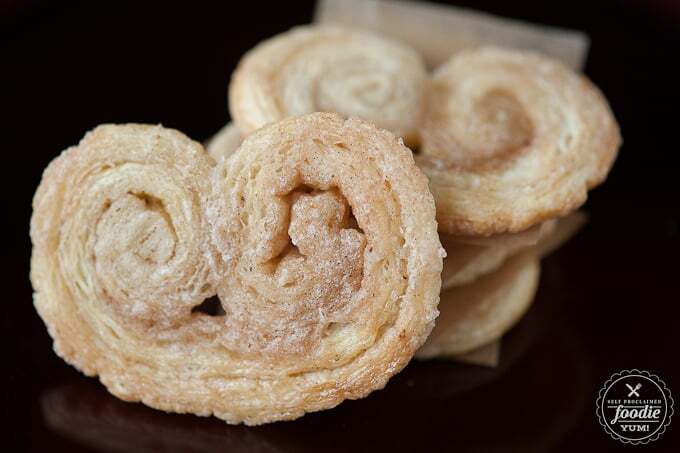 Sprinkle with two tablespoons of the sugar mixture and then top with the second puff pastry sheet. Top that with the remaining sugar mixture. Roll that stack in one direction only to press the sugar into the dough and to lengthen the 10x10 square into a 10x12 rectangle. With the long edge facing you, tightly roll up the left and right sides until they meet in the middle, leaving you with a 10 inch long roll. 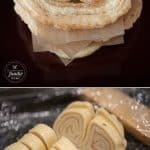 Wrap tightly with plastic wrap and store in the freezer for 45 minutes. 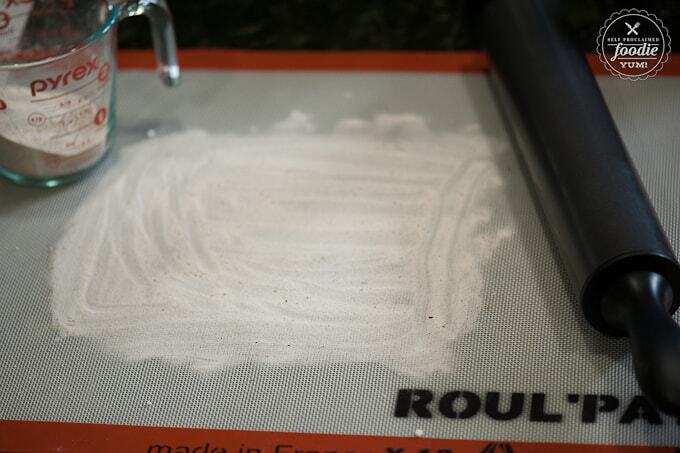 Preheat the oven to 375 degrees F and line two baking sheets with a silpat or parchment paper. 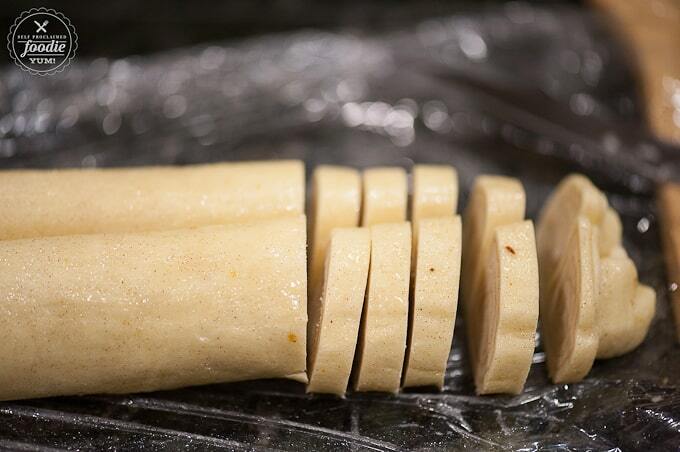 Take the wrapped dough out of the freezer. 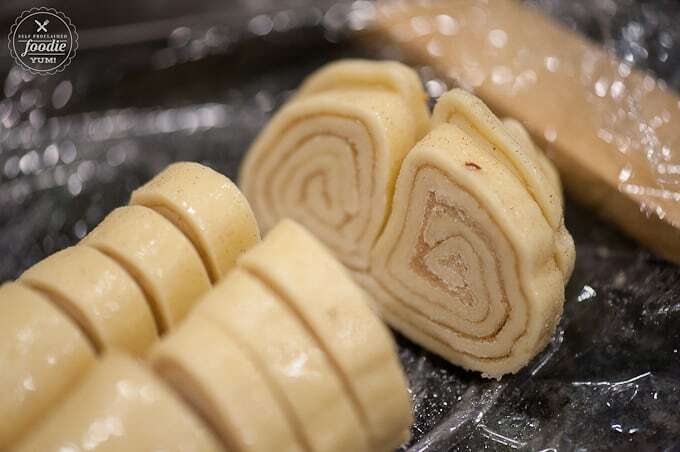 Using a very sharp knife, divide the dough into half and store half of it in the freezer until you're ready to bake the second batch. If you don't want big expanded cookies and like to keep them petite and uniform, its crucial you bake chilled dough. Slice first half into 3/8 inch thick slices. You should get about 12 slices. Don't worry about the end piece being ugly - you'll get to eat it as soon as it comes out of the oven. Bake in preheated oven just until the cookies start to get golden, about 14-16 minutes. Flip them and bake for another 4-6 minutes. Immediately transfer to a cooling rack. These are not the kind of cookies you want to leave on a warm baking sheet. Follow the same steps with the second half of the dough.